The ramblings of a film obsessive. If you're young you have to remember that Fortean matters were big business for a time in the 70s. 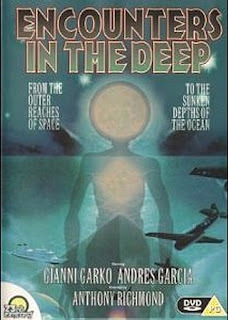 Charles Berlitz and Erich von Daniken sold millions of books, there were all kinds of TV shows about "unsolved mysteries", UFOs and the like, whilst Patrick Duffy flashed his webbed fingers as "The Man From Atlantis". Films were inevitable. The biggest of these was, of course, Spielberg's Close Encounters Of The Third Kind, but there were such things as Legend Of Boggy Creek (a surprise hit in the US that cost bugger all but took loads! ), The Bermuda Triangle (actually two films called this came out around the same time in the 70s, one by exploitation legend René Cardona Jr), huge budget all-star Hollywood disaster film Airport '77 dabbled in adding The Bermuda Triangle to the story, and so on and so on. As I said, Fortean weirdness was big business. As with any other trend, the Italian film industry could not ignore it. And so it was that - with very little money - Italian cult journeyman director Tonino Ricci made two films related to weirdness in the seas near Bermuda. The first of these films also managed to cram shark threat into the story (also big business in the 70s, of course!). This mish-mash of mind-controlled sharks, underwater people and The Bermuda Triangle was variously called Bermude: la fosse maladetta, Cave Of The Sharks or variations thereon, and it must have done enough box office for someone to allow Ricci to return to Bermuda to combine the Triangle myth with another of Spielberg's hits, this time Close Encounters instead of Jaws. And so it was that the world came to receive Encounters In The Deep. Even by the standards of low budget Italian rip-off cinema this is something quite remarkable. It is one of the clumsiest, most disjointed, desperate, narratively thin and just plain bizarre excuses for a film Italy ever came out with. And it is marvellous for it. The story is all over the place! Threads are started, ignored for ages, then suddenly remembered. Weirdly, it all actually comes together at the end! Astonishing! Technically everything is perfunctory, nothing excels, yet nothing is truly awful - kind of average 70s TV film quality. And then there's the acting and dubbing...the performances of the main cast are fine really, as you would expect for an Italian cult cast of the time, but the smaller parts...dear Lord! There are several people playing sailors who seem terrified to be delivering lines and look like they've been grabbed off the street and slapped into a white uniform! It is hard to believe that these were the best takes! And the dubbing doesn't help either. This is just awful! The dubbing actors are as bad as the actors on screen (or are trying to compensate! ), with terrible delivery, weak voices and awkward mid-sentence pauses. But chief amongst the issues rendering this hilarious is the dreadful, dreadful dialogue written for this. Clearly poorly translated from Italian, the dialogue is joyously bad. I found myself rewinding to hear lines again. This redefines clumsy dialogue writing for me. 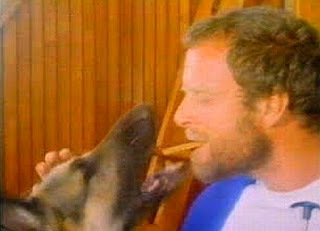 There is a German Shepherd key to the plot who delivers one of the better performances in the film. And then there is Gianni Garko. One of my very favourite actors from the Spaghetti Western era, this man was a charismatic and cool performer, handsome and brooding, but capable of lightness and humour - the perfect midway point between Franco Nero and George Hilton. Here he looks tired, his hair is receding and he suffers the indignity of a truly embarrassing pair of Speedos for far too much screen time! He tries to give his best - you can tell - but then all his efforts are crushed by the single most inappropriate dubbed English voice I have ever heard in any film. He is given the voice of a dim-witted American sidekick that makes him hilarious. You have never seen a voice less suited to the person from which it is coming. A mysterious grotto is found and it turns out to be an uncharted island populated by aliens. Ah, the aliens! They only actually appear very briefly onscreen and they are magnificent. The alien design here consists of an attempt at Close Encounters-esque "grey" type extraterrestrials. However here, they are rendered through the genius idea of getting several slightly boyish figured women to wear skintight silver spandex catsuits and a head-encasing silver-grey crash helmet and then move in a slightly mysterious manner. Wonderful. Then in a stone cold rip-off of Spielberg, all the disappeared people are on the island surrounded by white light looking beatific and urging the heroes to join them. Then the island blows up and a spaceship flies out of the island into the stars. I know I have rambled on about this film, but I feel like I have made a magnificent discovery. This is excellently bad. Ed Wood bad. Thoroughly enjoyable and often jaw-dropping to behold. I shall treasure my dodgy 23rd Century DVD of this film. I shall introduce it to the chosen. I feel like something very special has come into my life. I feel strangely honoured.